We are proud to offer this shining star example! This beautifully toned Draped Bust is over 200 years old and is in INCREDIBLE condition! 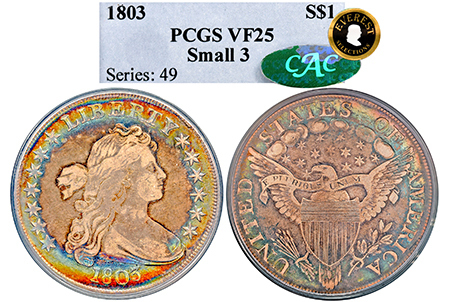 This Draped Bust is 1 of only 45 examples graded VF-25 by PCGS! Finding a Draped Bust example with any detail is a feat, not to mention finding one free of large reed marks or other significant marring so common for examples of this date and age. While this 1803 shows some wear, clearly defined details and golden highlights delineate her hair, face, and collar line beautifully. The reverse details are almost completely intact! This magnificent example features a vibrant rainbow- a halo of indigo, violet, ocean blue, sea-green, lemon yellow, sunburst orange, fiery red with a hint of magenta circling the rim of the coin and accentuating Liberty. The reverse features a muted and pastel reversed rainbow playing along the rim: pink, yellow, mint, teal, and aqua halo the central portion of the reverse. Truly an incredible example in both rarity and eye-appeal!